Advice for U.S. government personnel assigned to duties relating to Africa: The sheer diversity of the continent, approximately three times larger than the United States in both land mass and population, makes it impossible to apply a fixed set of indicators to explain its social, economic, political and security dynamics and challenges. Furthermore, if the finer nuances and issues in each country context are not well understood—and if the right sets of relationships are not established—it will be difficult, if not impossible, to build the level of trust required to deepen the U.S.-Africa relationship. These are some of the issues discussed at the Introduction of African Security Issues (IASI) Seminar scheduled for January 27–30, 2014, in Washington, D.C. IASI is the Africa Center’s in-house program designed to equip U.S. government officials with an understanding of African political, security, economic, and social issues and trends. 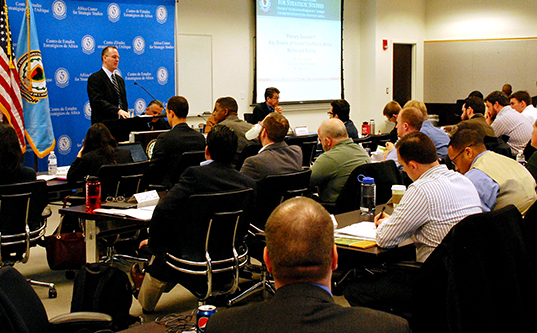 The session brought together approximately 40 staffers with Africa responsibilities from various U.S. government departments and agencies, including the Department of State, the Department of Defense, Defense Intelligence Agency (DIA), Defense Threat Reduction Agency (DTRA), Defense Security Cooperation Agency (DSCA), United States Agency for International Development (USAID), Federal Bureau of Investigation (FBI), Office of the Director of National Intelligence (ODNI), and U.S. Africa Command (AFRICOM), among others. 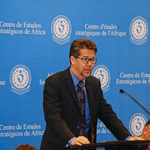 Mr. Baaré also told participants that the quality of their analysis on Africa would greatly depend on the quality of their connections and the cultural appropriateness of data collection methods. “Because African partners consider it impolite to say no to foreign interlocutors, data collection methodologies requiring simple ‘yes’ or ‘no’ answers are unreliable in the African context. … A conversational, relationship-building approach is much more valuable,” Mr. Baare observed. Ms. Lauren Ploch Blanchard, an Africa analyst with the Congressional Research Service (CRS) echoed similar views. 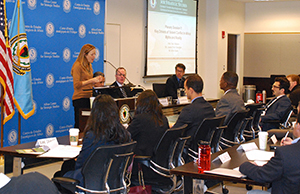 Ms. Blanchard, in responding to a question about how the United States could develop more strategically focused defense partnerships with African countries, urged participants to understand key elements of the African strategic culture. 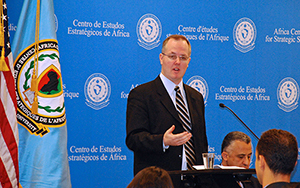 Professor Paul Williams, an Associate Professor of International Affairs and Director of the Security Policy Studies Program at the Elliot School of International Affairs at George Washington University, urged participants to develop a better understanding of the African Regional Economic Communities (RECs) such as the Economic Community of West African States (ECOWAS) and Southern African Development Community (SADC). “Besides forming the foundations for the Regional Standby Brigade mechanisms, the RECs have over the years developed capabilities and experience in early warning, peace enforcement, and peacekeeping, which are all part of Africa’s emerging peace and security doctrine,” he stressed. Professor Williams, who is also a visiting professor at the Institute of Peace and Security Studies at Addis Ababa University in Ethiopia, also advised participants expecting to deploy in conflict zones to be sensitive about the message that the military uniform conveys to victims of conflict. In concluding the question-and-answer session, Mr. Baaré of the World Bank reminded the audience that Africa has over the years created several institutional and normative frameworks such as the African Charter for Human Rights, New Partnership for African Development (NEPAD) and the African Charter on Democracy, Elections and Governance (ACDEG).